A famous book always seems to drag along more baggage than it should. When I know of a book but haven't read it, I tend to delude myself into thinking that I know the book. For example, I've never read Dune, but I have an odd confidence that I know what it is, and what it is all about. I have a sense based on all sorts of cluttered nonsense that has cobbled itself together into an illusion of an understanding, and the moment I start reading it there will be a sudden falling away. The brain is a wicked beast this way, assembling assumptions, and I forgive it these miserable trespasses because it always proves itself fully plastic in that moment of vacuum. The moment of vacuum when you set eyes on the actual words, and your brain detonates the clutter and there is an eerie stillness of nothing. Why does this often seem a more rewarding experience that a true blank slate? Or is that just me? I picked up Heller's (only1) classic novel with some odd sense that it would be like Joseph Conrad; that it would be a dark and strongly narrative; that it would be a personal story through war and self; that it would be sequential, uniform and fairly serious. Why did I think any of that? I can't say, the sources for all these misapprehensions were presumably razed along with everything else in the reading of the first chapter. What I should have imagined it to be was something like Kurt Vonnegut, because it is something like Kurt Vonnegut. It isn't entirely, but if you are sitting down to not read this book tonight, that is a much better wrong place from which to not begin. Catch-22 is not serious, it is absurd. It is not narrative, it is episodic. It isn't sequential, it is looped and deconstructed in time. It is not uniform, it is fragmented and shifts tone. It isn't personal, it is almost maniacally impersonal. Or at least, all of this becomes very clear in the first half of the novel. By the end, things are much harder to pin down so neatly. 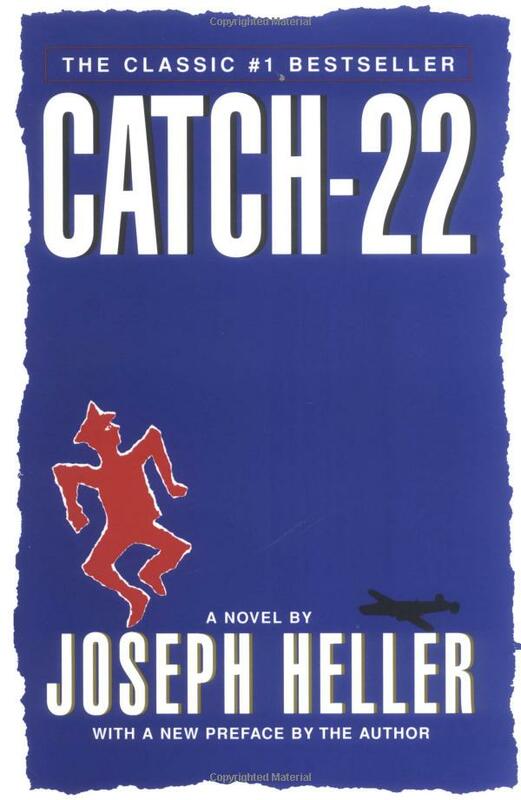 The protagonist (of sorts) is Captain Yossarian, a American bombardier in the Second World War, stationed in a fictional air force base on a non-fictional but fictionalized island off the coast of Italy. Yossarian threads through everything, but particularly in the first third of the novel we can lose sight of him for as much as a chapter as characters, situations and settings are carefully and comically presented. We flit from one character to another with only loose connections joining one chapter to the next, and in each chapter are a handful of half-resolved threads that are drawn up again later. Laid thickly on top of all these vignettes is a double helping of uproarious absurdity that had me laughing aloud regularly. Dark absurdities are picked up and played with for a bit, then set down again: the absurdity of military structure, of medicine, of faith, of death, of trade and commerce, and particularly the absurdity of the war. The tone is comic, but the motions of a comic novel are restricted in this setting — it becomes clear that we investigate many of these absurdities, but have to move along when the absurdity meets the horror. We learn, for example, that during a bombing mission gone horribly wrong, an officer named Snowden is killed. Yossarian is never the same after, and the change in him is a catalyst for the absurdity of his awakened responses to his surroundings. He is in a situation where he is nearly certain to eventually die in any number of horrible ways, but in an environment where self-preservation is absurd, and the structures that work to suppress self-preservation are equally absurd. Again and again, the narration picks up Snowden's death, but is forced to put it down again before fully investigating it. The absurdity here is the kernel of the novel, and what Catch-22 really is. The idea that reality and reality exist mostly at cross purposes with each other, that survival means non-survival and non-survival means survival. If you want to fight, you are crazy and shouldn't; if you want to run you are sane and you should be made to fight. It also means that power is predicated on order but can only create disorder. That rules exist to be enforced but not read, that belief is tolerable only in a vacuum of understanding. But in painting this characterization of the great disorder, Heller is meticulous but not self-conscious in his structure. While he apparently meanders randomly through his landscape, something odd happens. The absurdity remains, but I stopped laughing. With the people and concepts laid out carefully with us in a comic and open mood, he rotates everything 90 degrees and he has us trapped. Yossarian cannot escape this dark comedy alive, Dunbar simply ceases to exist, Orr evaporates into the sea, others fall into despair, others into madness2. In the first half I found myself irritated as Heller introduced character after character after character, the last half I realized he had to — this is a war and they will all be consumed before the end. When they are finally revealed to us after much preparation, the demises of Snowden, McWatt and so many others aren't any less absurd. But this absurdity is tragic as well as comic. When Catch-22 was first published, some of the major reviewers felt it lacked craft. It has an ambling sense to it that feels disordered until it comes together and you comprehend the structure. And here, perhaps, is where the baggage does the novel a great favour: I read this knowing it was a classic, and I was patient with the quirkiness of the form. Though my strange expectations fell away quickly, my great expectations didn't, and I read a great book where I might have just tolerated an amusing book. 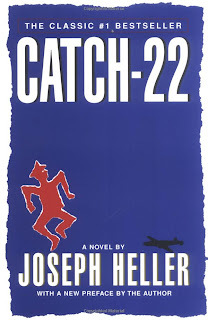 From Heller's New York Times obituary: "When an interviewer told Mr. Heller that he had never written anything as good as Catch-22, the author shot back, 'Who has?'" Despite all of this, I should note that the book ends on an attempt at hope. It didn't entirely work for me, but the skill of the construction redeems it entirely. Though I would like to say more, I've already spoilered.